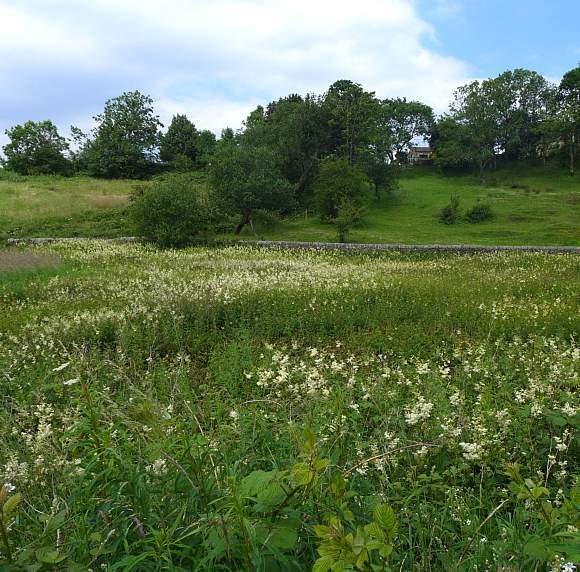 Meadowsweet can spread over large areas but needs dampish ground to grow. 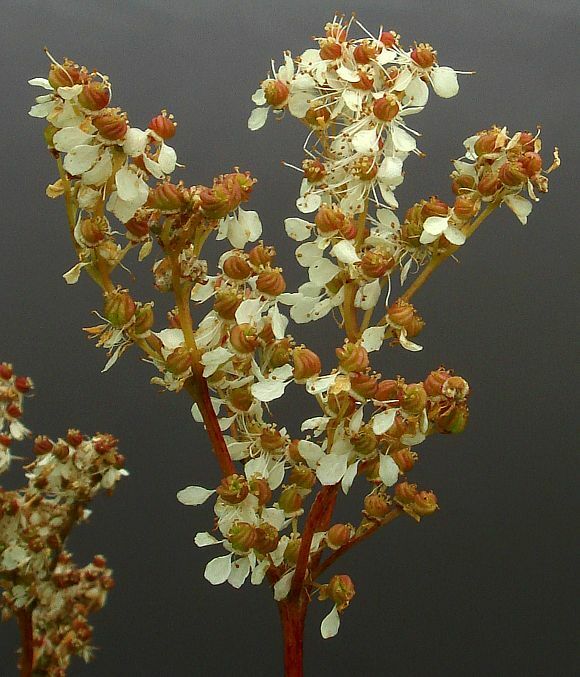 At about 2.2m high this specimen is much taller than Meadowsweets alleged maximum height of 1.2m. 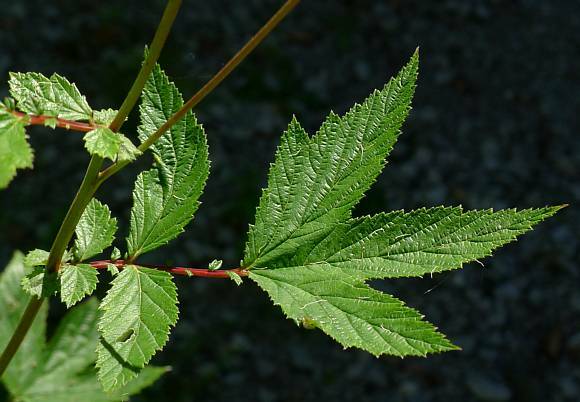 But it is not Giant Meadowsweet (Filipendula camtschatica) (which grows to 3m) which has terminal leaves with five and not the three lobes as in the above photograph. 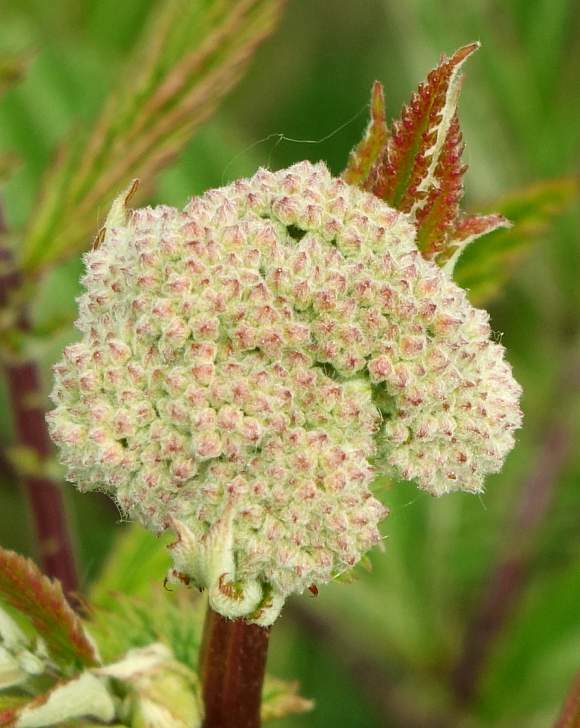 New leaves are characteristically deeply folded along the leaf-veins and are not immediately recognisable as being of Meadowsweet, neither are the early forms of the flower heads, which looks more like a miniature cauliflower . The flowerhead before fully formed. The young leaves highly folded along leaf-veins. 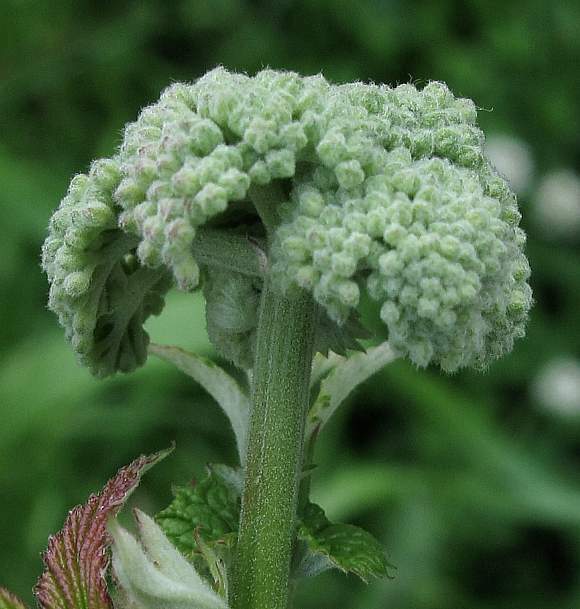 The young flowerhead looking even more like a cauliflower stems have very short hairs as do the as-yet undeveloped flowers which are tiny, and have 5 lobes where the 5 petals and other parts are forming. Likes growing near water or on wet ground. 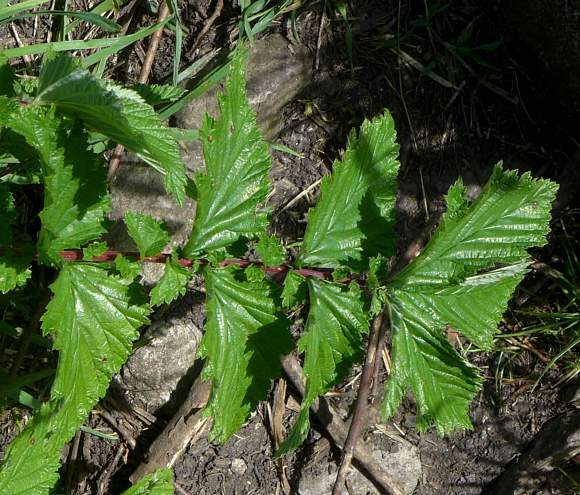 The main stem has leaves growing off at various heights, each leaf being compound. Most terminate in a 3-lobed leaflet, or sometimes 5-lobed. Other leaflets vary remarkably in size, some tiny, but are in opposite pairs. 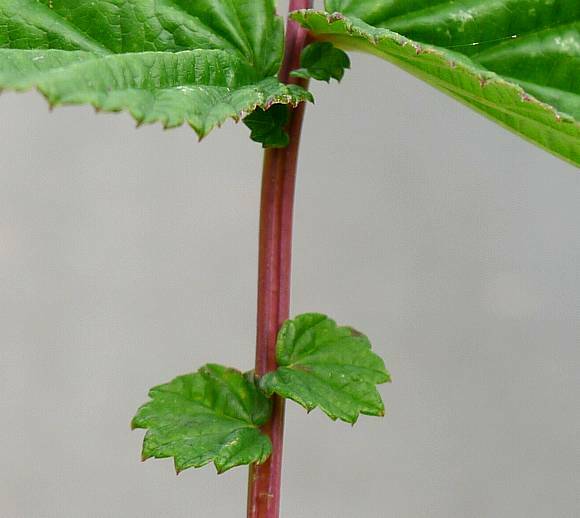 The leaves are typical of the Rose Family, crinkly and in pairs up the stem, varying enormously in size with many tiny ones, but the terminal leaflet has three lobes. Typical three-lobed leaves terminate side branches. The terminal leaf has three (sometimes five) lobes, the other leaves are in opposite pairs, but of varying size. In between the large 'leaves' are smaller and much smaller 'leaves'. The leaves are toothed. See caption below. 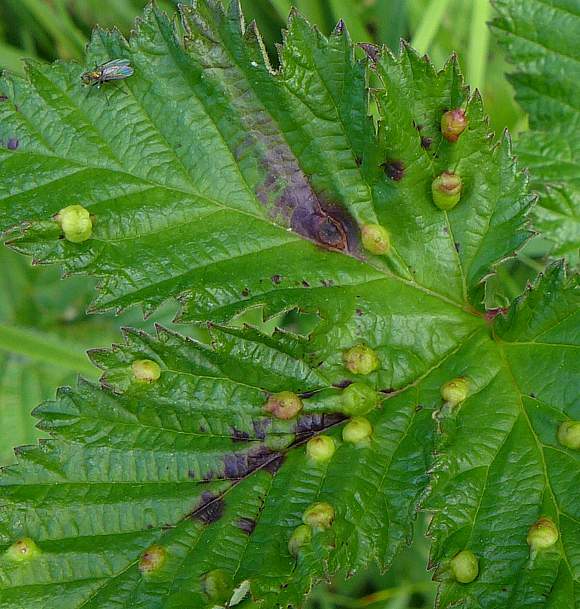 Large, tiny and small leaves interspersed on a reddish and grooved 'stalk', which is strictly a rachis on account of the 'leaf' being the whole thing comprising large, small and tiny 'leaflets'. When open, the creamy flowers have a frothy appearance. A foam of sweet smelling flowers. 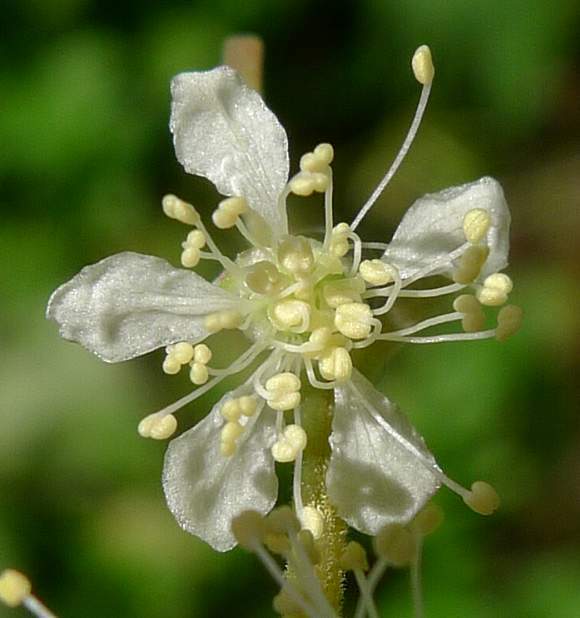 The froth is composed of numerous long stamens. 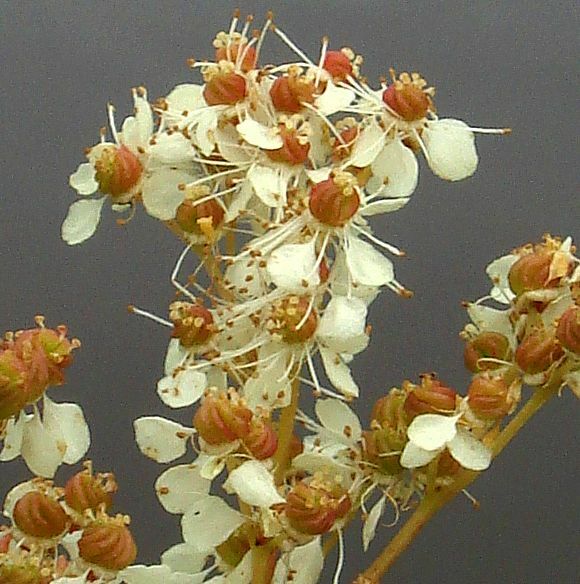 Un-opened flowers are small and spherical. An isolated single flower so you can see what's what. 5 white propeller-like petals and many straggly, long filaments with anthers untidily hiding the style in the centre somewhere. The fruits are beginning to grow. Fruits at the centre of the five-petalled flowers. The fruits, at first green, are in a tight spiral like a clenched fist. The white styles are still attached to the ends of each fruit, looking like a finger. 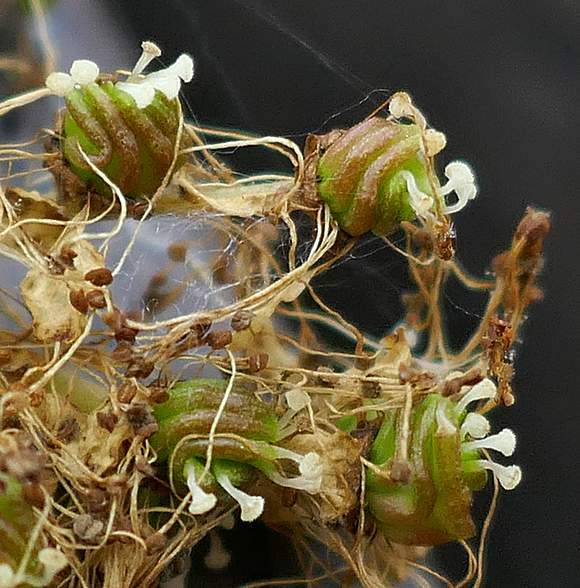 The mass of entangled stamens have all gone brown. Fruits are about the size of a match-head. 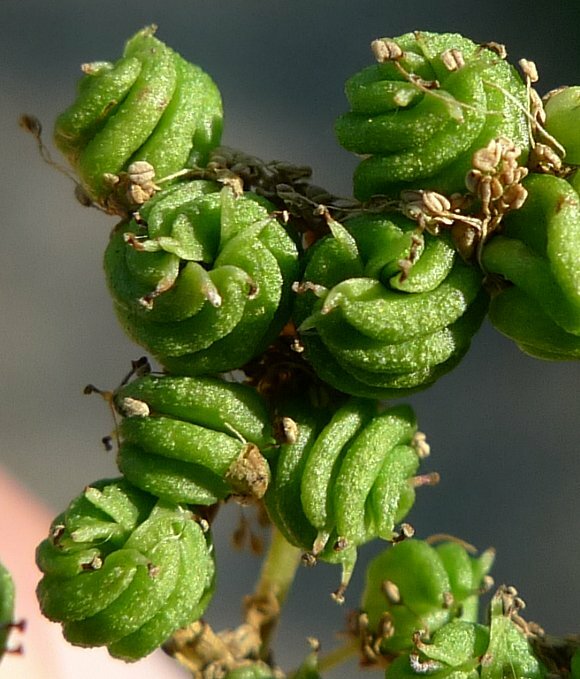 And, like the seeds of Lucerne or Black Medick, are tightly curled up. 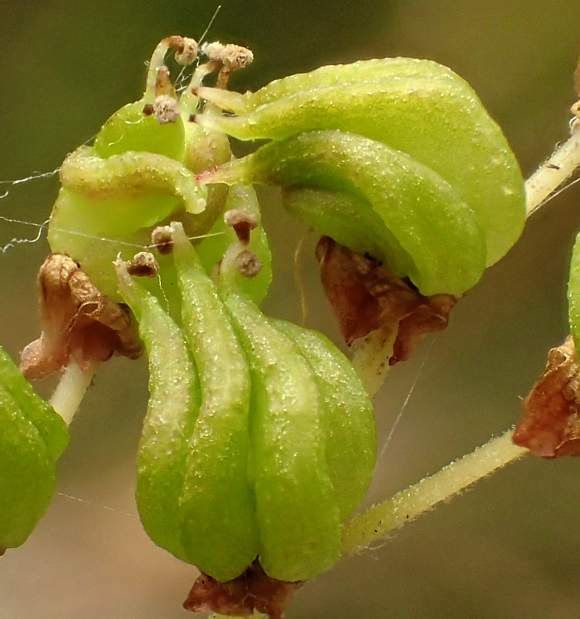 The topmost fruits still have their anthers showing and the single stumpy style at the end of each curled-up fruit. The fruits with styles still attached. 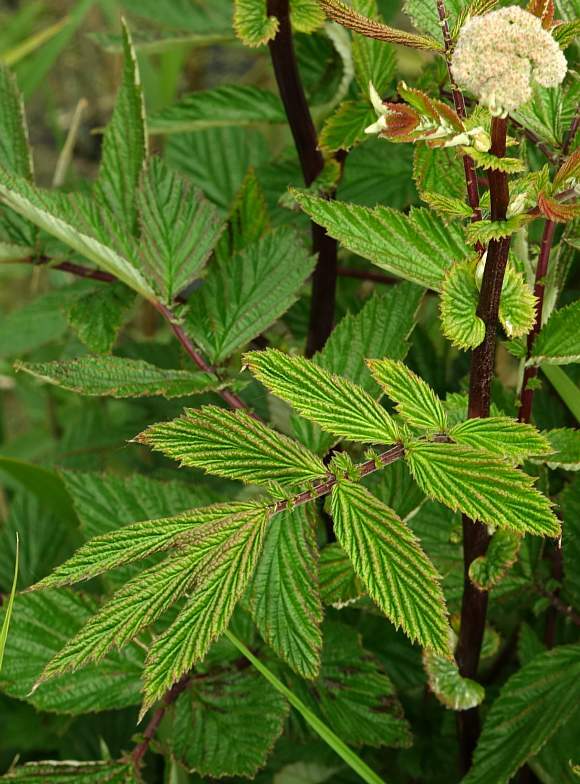 Bright-orange swellings on the leaf-stems or the veins of the leaves of Meadowsweet. 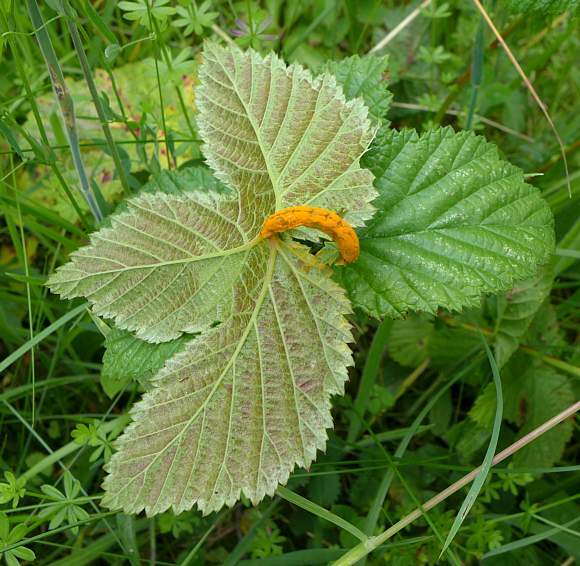 Your Author rested this leaf upside-down on top of another un-infected Meadowsweet leaf (so it might be now...). A finely grained 'powder'-like rust fungus. The rust has formed a gall (swelling) which are mainly seen early in summer with affected leaves becoming swollen and severely distorted. It scatters spores known as teliospores (aka teutospores) which are usually (in most species of rust) the dormant over-wintering resting stage of the rust (and often dark brown or black) which will start the a new infection in the next spring. Your Author can only guess that the diamond-shaped gaps are caused by the great banana-shaped swelling of the leaf-stem caused by the rust. 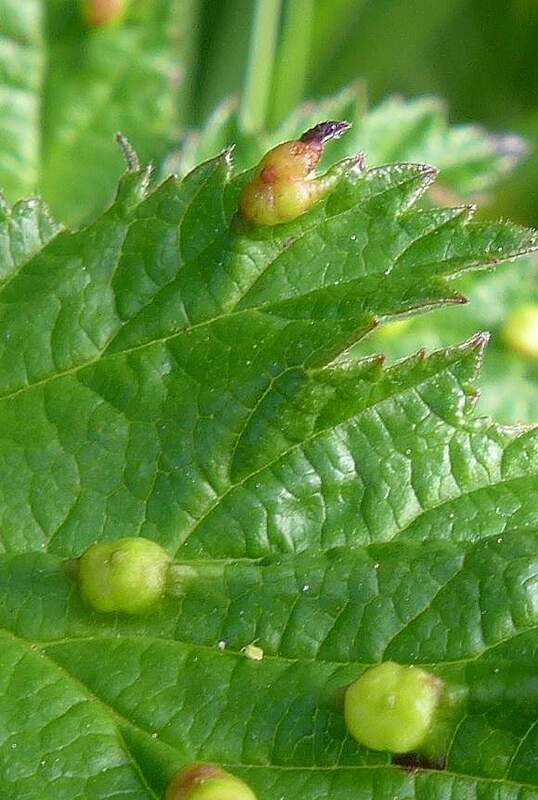 This gall midge creates smooth red pimples on the upper surfaces of the leaves of Meadowseet. They are up to 2mm across and usually occur on the veins. They turn reddish and have a tiny and very short pimple on the top. 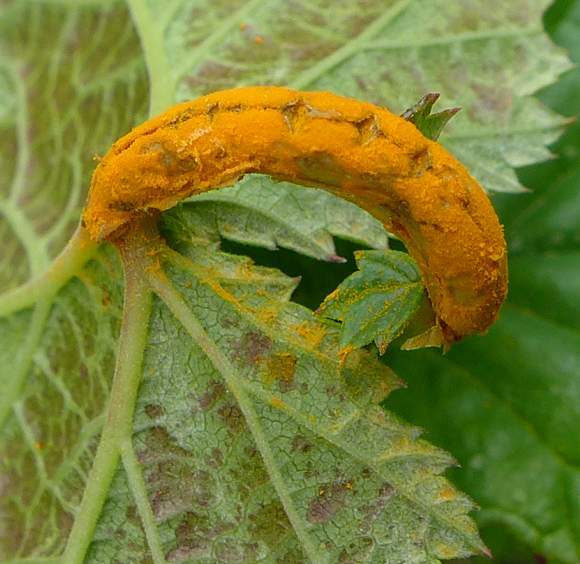 When the yellow larvae inside are ready and pupate within the gall the midges dig their way out from a tubular spiky yellow and hairy projection on the underside of the leaf. Distinguishing Features : A sweetly smelling frothy foam of creamy white flowers. 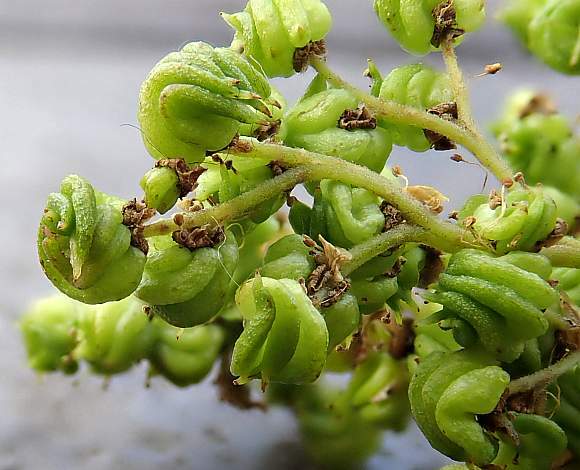 Also the fruits are spiralled into a tight ball looking like a miniature clenched fist with four fingers, some crossed, about the size of a match-head. Always grows beside freshwater. 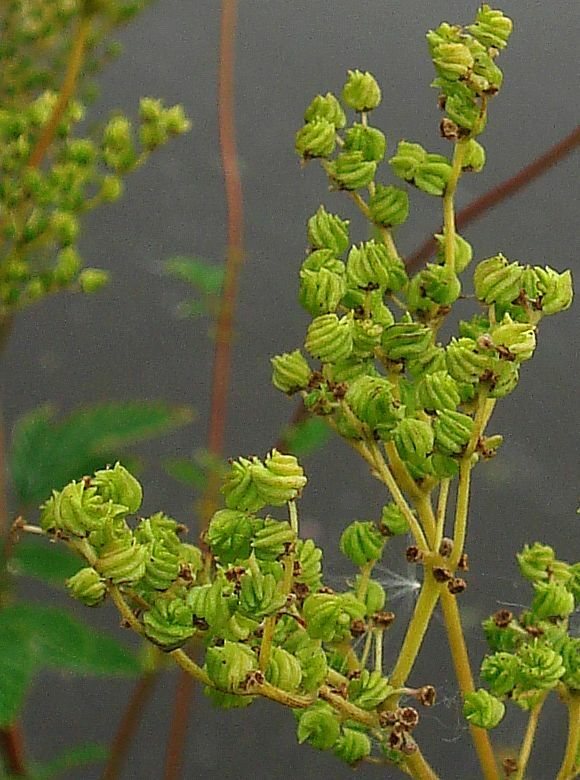 A greenish-yellow dye can be extracted from the flowering tops this plant, whilst the leaves and stem yield a blue dye. The roots yield a red/pink dye or black dye when a copper mordant is used. 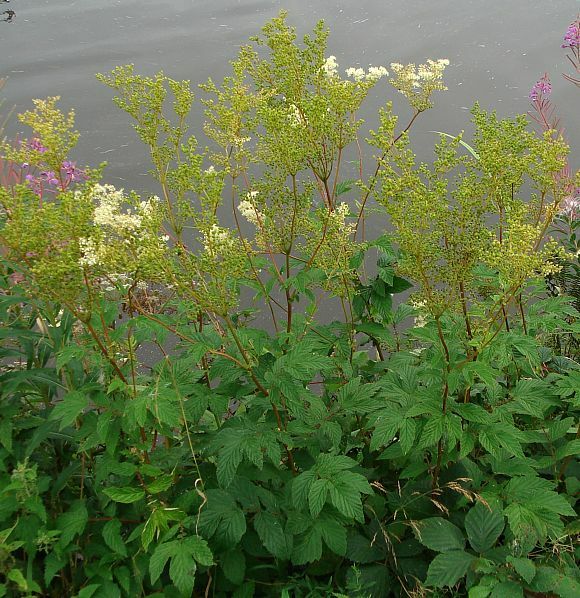 When not in flower, Meadowsweet leaves look very similar to those of Agrimony (Agrimonia eupatoria), but the latter has paler leaves and hairy stems midway up (whereas the stems of Meadowsweet are reddish and hairless). 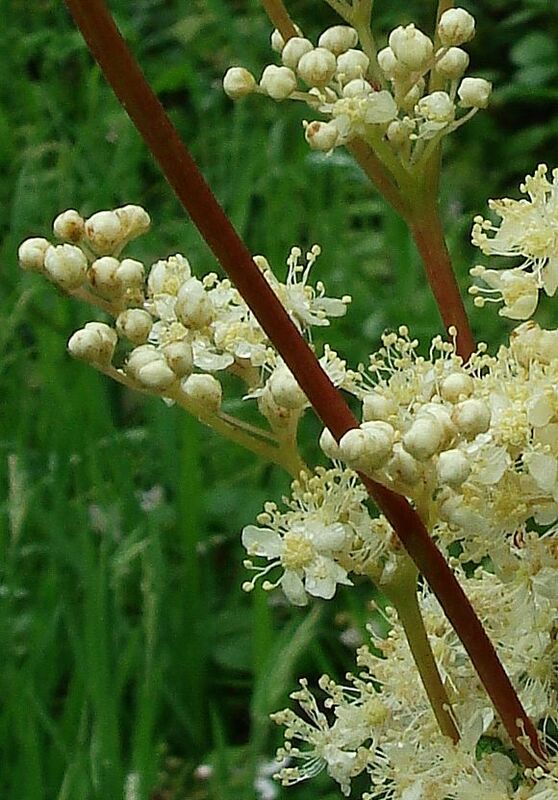 Meadowsweet is related to Dropwort which is in the same Genus. 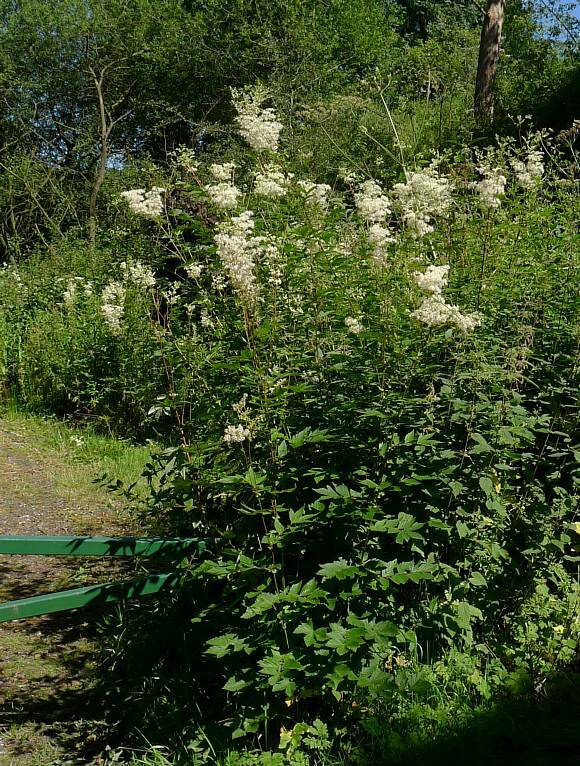 The name Meadowsweet is thought to derive from its use in Mead, an alcoholic beverage made since the middle ages, and because it has a very sweet smell. 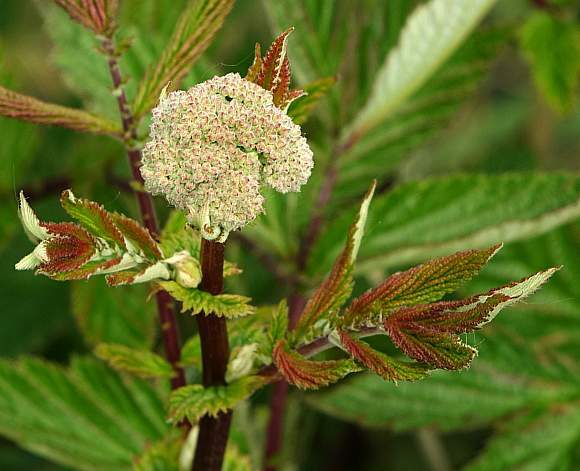 In 1839 it was discovered that the flower heads contain salicylic acid, from which aspirin (acetyl salicylate) was later manufactured. 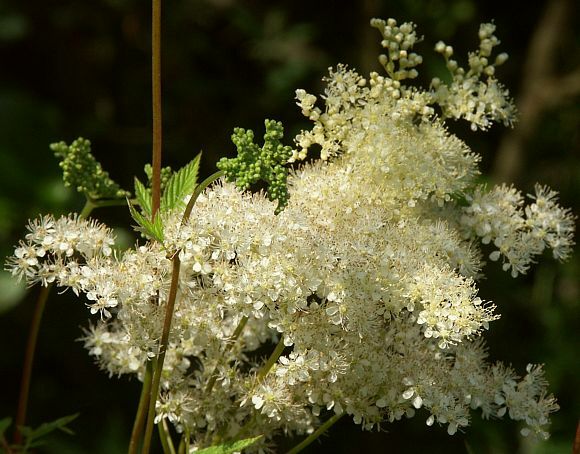 The flowers can also be used to make into a wine, and also like elderflowers to flavour pancakes. The flowers smell sweet, some say of marzipan. 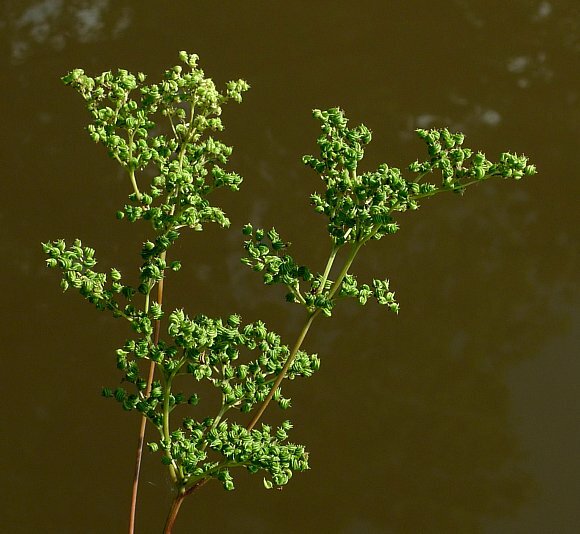 Salicin is a pharmaceutical drug used as an analgesic and anti-inflammatory agent which is found mostly in the bark of the tree White Willow (Salix alba) (from which it is commercially extracted), but was first found in Meadowsweet. It has a bitter taste similar to Quinine. 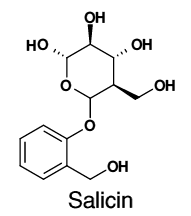 Salicin is a phenyl β-glucoside. 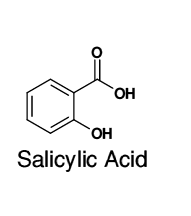 When metabolised by the human body it is converted to Salicylic Acid. 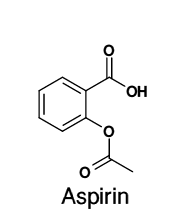 Aspirin (Acetyl Salicylic Acid) also has pharmaceutical uses in humans; such as to thin the blood and prevent the clumping of platelets within the blood which helps prevent the blood from coagulating and thereby causing thrombosis. In lower doses it is used to prevent heart attacks, strokes and blood clotting. 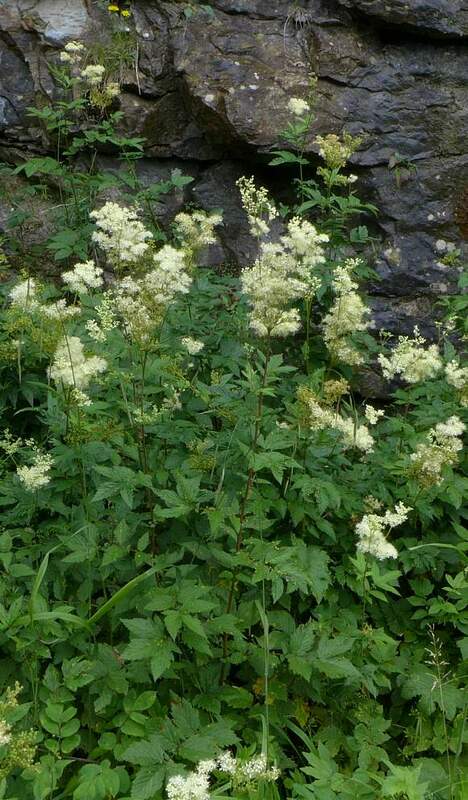 It also has anti-pyretic and anti-inflammatory effects and is used as a general purpose medicine at home for influenza and colds (or was - its use in such roles is now discouraged). It is a NSAID (non-steroidal anti-inflammatory drug) and one of the most widely used drugs, being manufactured commercially. Aspirin has certain undesirable side effects, namely bleeding of the stomach, gastro-intestinal ulcers, tinnitus, and the risk of Reye's syndrome in children. It should not be used by those with stomach ulcers, or by those on Warfarin, another blood-thinning drug. 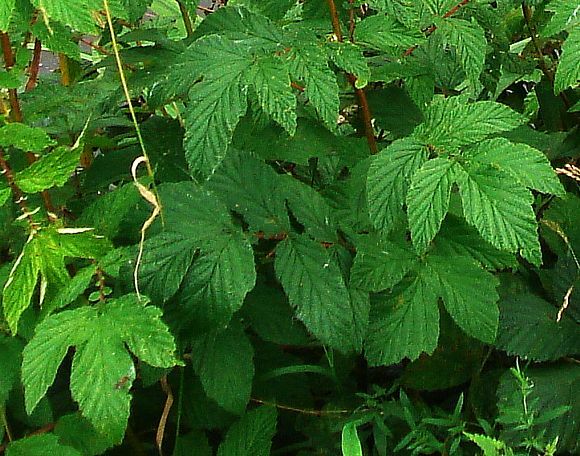 Methyl Salicylate is used pharmaceutically as a rubifacient in deep-heat ointments and liniments, and as flavouring in some candies and chewing gums as an alternative to the more popular Spear Mint and Peppermint flavours. It is also used as an antiseptic in mouth wash products. 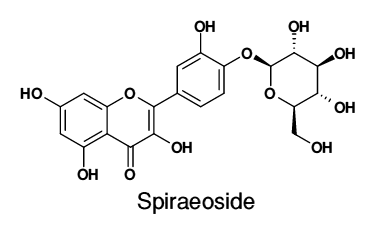 Aspirin, or Acetyl Salicylic Acid, is also found in plants, being a plant hormone ( phytohormone ) which not only helps the plant grow but also is involved in a pathway signalling the presence of plant pathogens and mediating the plant defence against the pathogens. Once activated by a pathogen, it is also involved in inducing resistance to the pathogen in parts of the plant not yet infected. 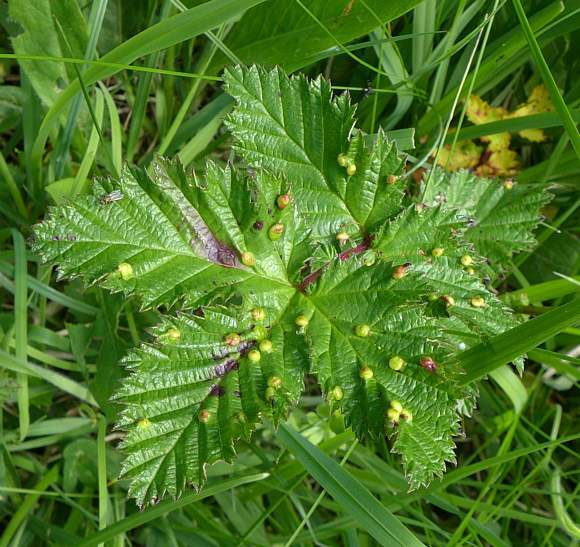 The signalling process also invokes the conversion of salicylic acid into the volatile ester, methyl salicylate, whereupon it can then drift through the air to other nearby plants to prime them against the presence of a nearby pathogen or pest, warning of their proximity by remote control. 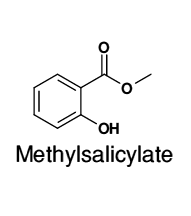 Methyl Salicylate is also called Oil of Wintergreen, and is indeed produced by the Wintergreen plants, such as Round-Leaved Wintergreen, some species of Gaultheria , most members of the Pyrolaceae Family, some species of plants of the Genus Betula and all species of plants of the Spiraea family, including Dropwort. Trials will soon be underway to determine whether preliminary indications that regular small doses of Asprin every day can hold back the re-spreading of a certain few cancers is true. There are anecdotal indications that small doses of aspirin have helped prevent the re-spreading of certain cancers such as prostrate cancer after the cancer was successfully treated. The trials due to take 5 years commencing from 2016 will try to determine if there is any validity in this. The trials will use doses of 300mg, 1000mg and a placebo to determine the validity. In the meantime, patients should never self-medicate without first consulting a doctor; extended low doses of aspirin can be dangerous. 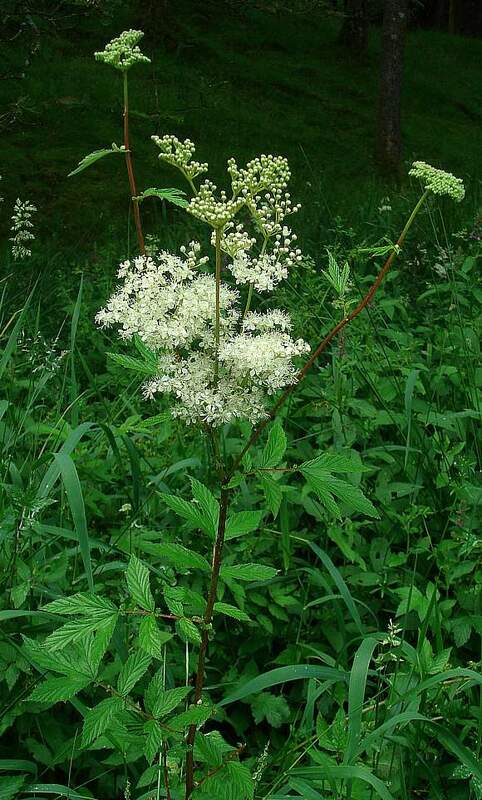 To humans Methyl Salicylate, being an ester, smells sweet, hence the name Meadowsweet. Methyl Salicylate is, however, not only toxic but also an insect pheromone. By this means the plant is also able to attract beneficial insects that will help kill the invading herbivorous insect pests.